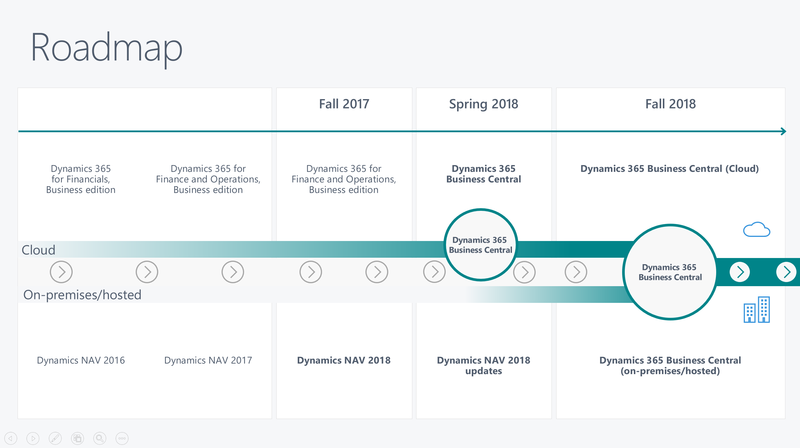 With the October '18 release, Dynamics NAV transitions to Dynamics 365 Business Central on-premises. Since Dynamics NAV and Dynamics 365 Business Central share the same code base, the transition for customers from Dynamics NAV to Dynamics 365 Business Central is as seamless as just another Dynamics NAV upgrade. Upon upgrading, they receive the new, refreshed, and highly productive user experience of Business Central, and the name of their product changes from Dynamics NAV to Dynamics 365 Business Central. 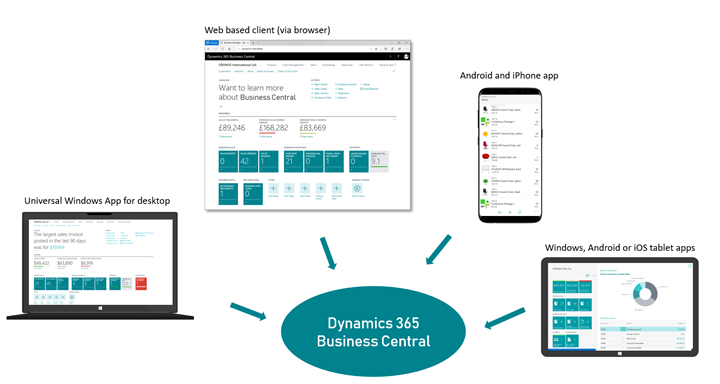 With the October '18 release, we are bringing the Business Central web-based modern productivity features and user experience to the on-premises and hybrid customers upgrading from Dynamics NAV to Dynamics 365 Business Central. Users connecting to on-premises, hybrid, or cloud deployments of Business Central (regardless of how they connect) will all benefit from the same productive and refreshed user interface and features. This ensures an easier transition and shorter learning curve for new-employee onboarding—all on top of new capabilities of cloud and AI-powered insights and data analytics for the Business Central customer, especially with cloud and hybrid versions. The full desktop mode is supported on computers running Windows 10. For more information on mobile/companion apps for Business Central, see Getting Business Central on your mobile device. The Dynamics NAV app remains available in the app store for customers still working on the Dynamics NAV platform and planning to migrate later to Business Central (on-premises, hybrid, or cloud). While Business Central is a cloud-first service, customers who need to run their workloads on-premises or on the intelligent edge connected to the cloud can now do so. With Business Central, once customers sign up for the service in the cloud, they have the option to deploy it locally to their choice of hardware. While they are running Business Central on their own hardware, customers will have a tenant in the cloud, and the data from the customers' hardware will be replicated to the cloud for intelligent cloud scenarios. At all times, customers are informed of their “replication success rate” so when they’re ready to transition completely to the cloud, it’s a simple step. The customer has the ability to see the details behind their replication success rate by drilling into the details and see the tables that have not replicated successfully. The customer data is always uploaded to the cloud from on-premises (customers can opt out if desired) to bring the intelligent cloud capabilities to the Business Central deployments on the intelligent edge. Business Central will be licensed through CSP, at the same price, regardless of where the customer (through a partner) deploys their solution. Partners are still able to customize on-premises solutions through code customization. However, doing that may degrade their replication services, because increasing the number of code customizations reduces the percentage of tables that can be replicated to the cloud. At all times, customers will see a tile showing the replication percentage and a list of the tables with issues so they can work with their VAR to determine the appropriate resolution steps. This is an important way for customers to continue receiving value from the intelligent cloud and the intelligent edge, regardless of the changes made to Business Central on-premises.